A joint initiative by SPECS, PREFACE and WCRP-WGSIP. A two-day workshop by invitation only. Objective: The aim of the workshop is putting in common the current strategies to understand the physical processes behind the initial shock and drift in dynamical climate prediction for all time scales and to formulate recommendations that will guide international future research activities. The question of bias adjustment will be considered as a necessary tool to engage with the users of the resulting climate information. The discussions will be based on the activities already taking place in the SPECS and PREFACE European FP7 projects and contribute to the activities of the initial shock and drift project promoted by the Working Group on Seasonal-to-Interannual Prediction (WGSIP) of the World Climate Research Programme (WCRP). Structure: The workshop will consist of talks, a poster session (format A0, portrait), breakout groups and a plenary discussion session. Attendees: Scientists and representatives from international programmes, prediction centres and funding agencies. Expected outcomes: Agreeing on a set of common tools for the diagnosis and treatment of the initial shock and drift in climate predictions. The attendants will be expected to contribute to a set of recommendations for the bias adjustment of the CMIP6 decadal predictions, in the light of the current experience in sub-seasonal and seasonal forecasting. The outcome will be made available as a report shortly after the workshop. The workshop will be followed by a meeting of the Decadal Climate Prediction Panel (DCPP) of CMIP6. This event is organised by the European projects SPECS and PREFACE and supported by the WCRP. 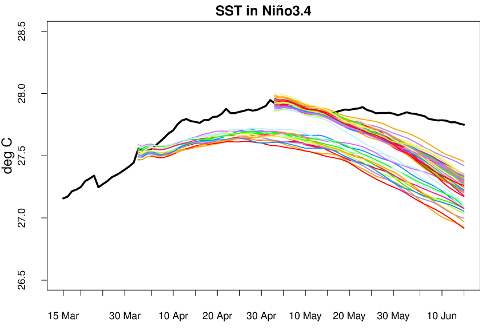 An example of model initial shock and drift in a seasonal forecast ensemble: the black line is the climatology of daily SST in Nino3.4, between 15th March and 15th June of 1993-2009, from satellite observations (ESA dataset). Each coloured line is the climatology of a different ensemble member from the ECMWF System 4 forecast (for the same period and region) for two different start dates, 1st April and 1st May. Please note that you will be able to exhibit your poster from day 1 on the "exhibition hall" that is available for us. The poster presentation will be done during the lunch and the Icebreaker. We acknowledge sponsorship of and the scientific interaction with the World Climate Research Programme to promote this work, coordinated in the framework of the Working Group on Seasonal-to-Interannual Prediction (WGSIP), and performed by the SPECS and PREFACE projects.